The Perfume Pagoda is one of the most important religious sites for Buddhists in Vietnam, where people flock to on pilgrimages. The pagoda itself was built into limestone cliffs and only can be reached by boat or on foot, as there are no access roads in the area. This one day trip includes gliding along a lovely stream, walking up hill, (cable car if needed) discovering Vietnamese Buddhism, and enjoying the fresh air of the country side. 12.00pm: Have lunch at a Vietnamese Restaurant., then after lunch move back down the hill, visit Thien Tru pagoda, whose architectures dates back to the 15th century. 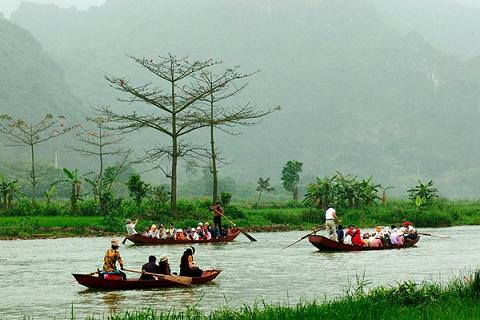 Return by boat back to Duc wharf, where on arrival you will take your vehicle back to Ha Noi. 5.30pm: Drop off at your hotel, where the tour ends. Note: Many tourists choose to ride the cable-car up the mountain, and then walk down the pathways there. Transfer (A/C van). English/French speaking tour guide if needed. Lunch. All entrance, permission and visiting fees. Cable car; Drinks, Others services not mentioned.